Lee Bo-ra, Kim Kyung-joon's wife, gives a press conference at the Wilshire Plaza Hotel in Los Angeles on Wednesday. The wife of Kim Kyung-joon, the convicted fraudster at the heart of the so-called BBK scandal that is threatening to engulf presidential frontrunner Lee Myung-bak, on Tuesday displayed copies of what she claimed were four under-the-table contracts suggesting that Lee was the real owner of the defunct investment firm. But Lee Bo-ra only piqued public curiosity by refusing at a Los Angeles press conference to reveal the content of the contracts. She said she would submit the originals of the contracts, which she claimed carry Lee Myung-bak's signature, to prosecutors by Friday. To confuse matters further, Erica Kim, the extradited businessman's sister, did not show up at the press conference although she had promised to reveal the contracts to reporters. ◆ Is Lee the Real Owner of BBK and DAS? Lee Bo-ra presented copies of four contracts she claimed had been submitted to the Korean prosecutors, saying the Korean-language version of those contracts was proof that Lee Myung-bak actually owned BBK, a dubious investment firm run by Kim and deregistered for forging investment documents in 2001. GNP lawmaker Hong Joon-pyo called on the family to disclose the contracts to the public. "If such contracts really exist, then the Kims must have forged them with a company seal Kim was carrying with him." Lee Bo-ra claims that DAS, a company invested in BBK to the tune of some W19 billion and whose largest shareholders are Lee Myung-bak's brother Lee Sang-eun and his brother-in-law Kim Jae-jeong, is in fact owned by Lee himself. She suggested Lee's own version is improbable, saying, "Suppose a young man you don't know at all suddenly comes into your office without prior notice. Suppose he presents a contract to you, suggesting that you sign it to invest W5 billion (US$1=W929) in a project you don't know anything about. Would you sign it or not?" But GNP spokeswoman Na Kyung-won said, "I understand that at the time, Kim Kyung-joon took the trouble to travel all the way to Gyeongju, North Gyeongsang Province, where the head office of DAS is located, to give a presentation to attract investors. If candidate Lee were the owner [of both firms], why did Kim need to persuade him to invest in the company? Candidate Lee's brother-in-law Kim Jae-jeong's shares in DAS do belong to Kim Jae-jeong, as prosecutors announced in August." ◆ When Did Lee and Kim Meet for the First Time? Lee Bo-ra claims her husband met Lee Myung-bak for the first time in early 1999, while the candidate says they met for the first time in January 2000. Koh Seung-duk, a lawyer for Lee Myung-bak, disclosed a handwritten memo by Lee Myung-bak dating from 2000 showing that he and Kim Kyung-joon discussed an investment project. Koh said this was "proof showing that it was in early 2000 that the two men met to discuss business for the first time." Lee Bo-ra brings up the name of Lee Jin-young, a former secretary to candidate Lee at LKe-Bank. During an investigation by American federal prosecutors, the secretary testified that candidate Lee's business card and the company brochure, which he claims were forged, are genuine. 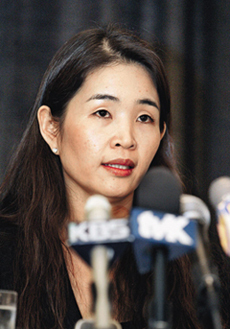 To back her own allegation, Lee Bo-ra showed a deposition videotape during the press conference showing Lee Jin-young testifying in front of American federal prosecutors on Aug. 28, 2006. In the videotape, an attorney shows Lee Jin-young the business card and the company brochure and asks if these are the same business card and company brochure Lee used when he was chairman of LKe-Bank. She replies, "Yes, they appear to be the same ones as he used when he was chairman." The attorney then asks whether the names of BBK and LKe-Bank are written on the same business card because they were one and the same. And she says, "No, they were not one and the same. But they were only affiliated with each other." GNP spokeswoman Na said, "In court, Lee Jin-young also said Kim Kyung-joon made such a business card, but Lee Myung-bak never used it. The business card must have been made by Kim for his own needs in the process of establishing” yet another firm called EBK Stock Brokerage. At the press conference, Lee Bo-ra only displayed the controversial contracts but did not disclose their content. She claimed the family were afraid that if the signature on the original was shown, Lee Myung-bak would "alter his signature" for a sample the Korean prosecution required of him to make out the contracts were forged. "Copies of the four contracts have already been submitted to the Korean prosecutors. We'll also submit their originals to them by Friday," she said. But the GNP's Hong Joon-pyo asked, "What was she talking about? Candidate Lee's signature is already on scores of other documents which have been disclosed to the public. They are not concerned about the signature itself, they're just afraid that the contracts will turn out to have nothing to do with candidate Lee and their allegations will prove unfounded."